Blow-dry finishing is an art that is making a beautiful comeback – to add volume to fine hair, to straighten an unruly curl, to tame a wild cowlick. And though the equipment remains the same, the technique is radically different. Our stylists are fully versed in the newest French Blow Dry finishing techniques. Holding the blow dryer to the angle of the brush and airflow creates an ultra smooth polish and shine like no other technique. We offer the right products to prepare your hair to protect it from the heat to prevent hair damage. We use and recommend Wella Luxe Oil a luxurious treatment that is a leave in to moisturize the mid length and ends. It’s an amazing process that we teach to our clients, so they can duplicate their Indulge signature look at home. We demonstrate how to apply hair products properly, and then we demonstrate the angle that they should use to blow dry their own hair. Fabulous. Our clients love the end results. . .and the fact they can reproduce them at home. Indulge salon provides special workshops individually and as a private party for you and your friends to learn how to french blow dry your hair to achieve your new look. This workshop is called BYOB. Bring your own blowydryer. You can bring your personal products that you have used, brushes, combs, crazy rituals to master your hair. 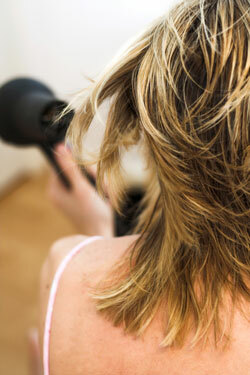 We will show you how to hold the blowdryer while drying the hair in the right direction. How to use your products and how to style it with the right products. $25 for workshop, 30 minutes. You receive mastery of your hair and a free home maintenance product to support your look. It’s more fun with friends. Schedule this in advance by a location nearest you. Also check out our Signature Colours.